I found the story of this mural on the Simply Knitting website. It has been knitted by the Bothy Knitters in Aberdeen to celebrate the Scottish Traditional Boat Festival (2nd-3rd July 2011) at Portsoy in Aberdeenshire. You can read the story of how it was made at the Simply Knitting website. 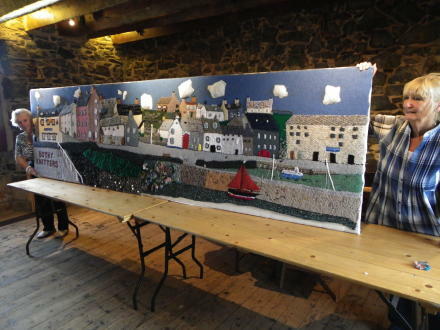 The mural can been seen at the Boat Festival booking office and then at the craft tent during the festival. 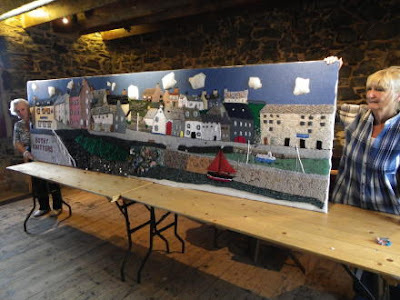 Our own knitting group meets on a Tuesday night from 7.30pm at the Harbour Howff in St Monans, although we're not attempting to create a knitted mural of St Monans harbour (yet! ), we are knitting for a very worthy cause - From Bonnets to Berets for the Pittenweem Arts Festival.